If your laundry is getting dingy-looking, and it smells a lot like last week’s campaign promises, perhaps you need a new detergent. And if you don’t have the heart to pay–or simply don’t want to–the high prices for detergents, what follows are five great recipes for your own homemade laundry soap. Run all of the ingredients through a food processor, add to a sack or bottle to dispense. 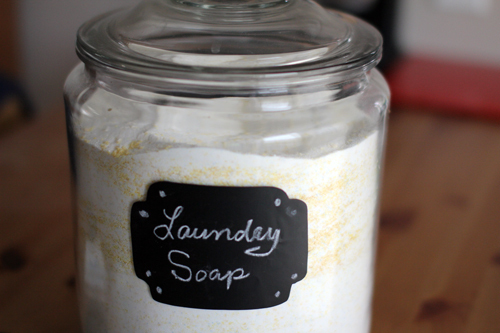 Add one or two tablespoons to your laundry. Combine these products in a one-gallon jug. Pour 4 cps boiling water in the jug. Mix until all of the ingredients are thoroughly dissolved in the liquid. Let mixture cool. Then fill to the top with cold water. OK. Why this one is called “Easy” is beyond us. Let’s just say that it’s easier to make than others. Everything you need to make it is here. 2 Cps Borax Mix all of this together, and you’ve got a great, and inexpensive detergent. Combine all of the ingredients in a large pot and bring it to a boil, stirring and mashing the lumps as it cooks. Turn the heat down and allow to simmer, and let it cook for 30 minutes. This takes out a lot of the excess water. After the simmering is finished, put the mixture through a piece of mesh into a clear jar for use. This recipe is great on everything but diapers. And that’s it. If all of these seems like a bit too much work for you, give the Laundry Center a call. With not only making your laundry cleaner than you have probably ever seen it, plus free pick-up and delivery, it couldn’t be easier. This entry was posted	on Thursday, February 4th, 2016 at 2:42 pm	and is filed under Main. You can follow any responses to this entry through the RSS 2.0 feed. You can leave a response, or trackback from your own site.